Fresh off an exciting first day, the Master's Division was up bright and early ready to tackle their final challenge, "Cindy." Nothing like a 20 minute AMRAP start your day! They kicked-off the second day at the Northeast Regionals with a bang, posting impressive scores, many hitting personal records. Joseph Romano (19+ rounds) and Susan Wong (10+) won their respective heats. Next on the agenda in the morning was the first individual event: 21-15-9 Overhead Squats at 135 pounds and Chest-to-Bar Pull-ups, which surely got the crowd going. After a rousing rendition of our national anthem by Melissa Mulligan from CrossFit Performance, the big guns of the Northeast took their hand at their first workout (21-15-9 Overhead Squats at 135/95, and Chest-to-Bar Pullups). Both men and women pushed hard to make their case as the early favorite to take the top place this weekend. Rob Orlando, highly regarded as one of the stronger competitors in the Men's Competition, did not disappoint, blazing through the workout in 4 minutes flat. 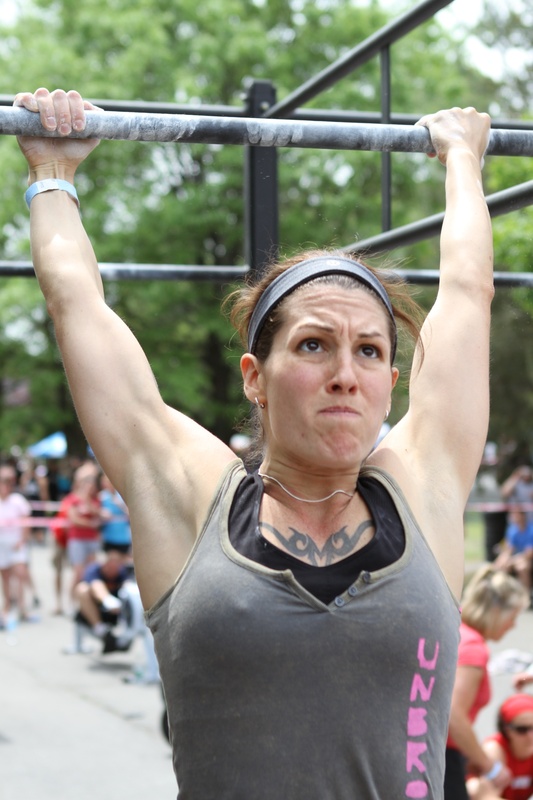 The women saw an equally impressive time of 5:56 posted by Stacy Kroon of CrossFit Fenway. As the crowd grew in number, you could feel the intensity rise amongst the spectators. After the morning was over, we turned our attention to the Affiliate Competition. Top teams after Day 1 were CrossFit New England, CrossFit Performance, and Guerilla Fitness, and they were looking to use this as their opportunity to separate themselves from the rest of the field. Again, CFNE and CF Performance did not disappoint, both finishing 1 and 2 overall in the second grueling event. 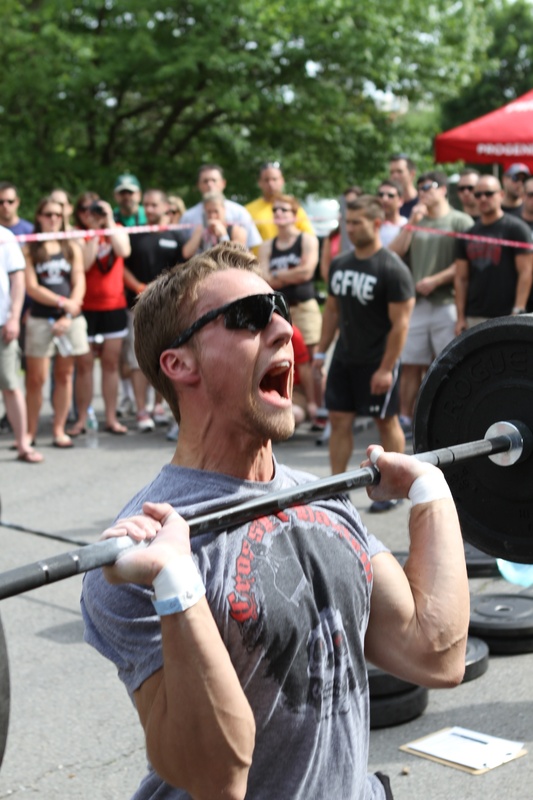 With the sun beating down, teams had to complete in total 100 of each in sequence: Power Cleans (135/95lbs), Box Jumps (24"/20"), Pull-ups (Chest-to-Bar), Sumo-deadlift High-pulls (95/65), and Burpees. The kicker is that one person had to be rowing at all times, until the team completed 4K. 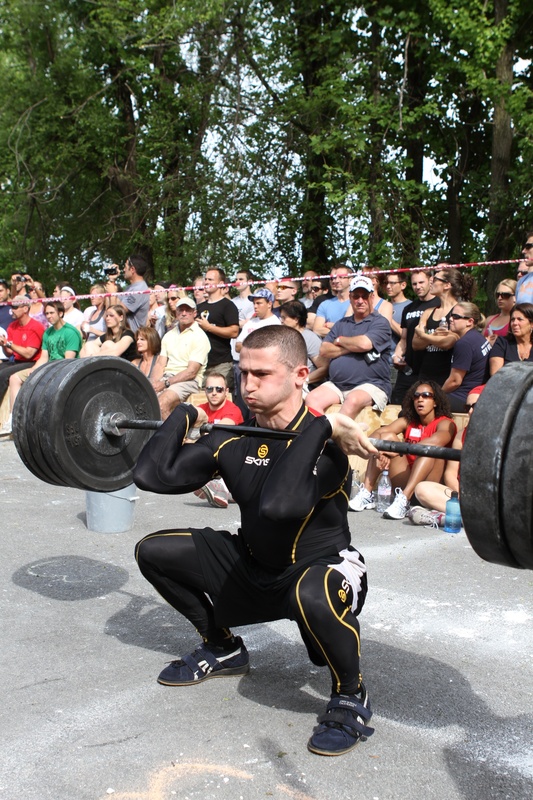 Once the row was finished, 2 athletes could perform the other movements at the same time. A great test of skill and strategy, this event demonstrated continuity and the ability to communicate to produce maximal outcome. 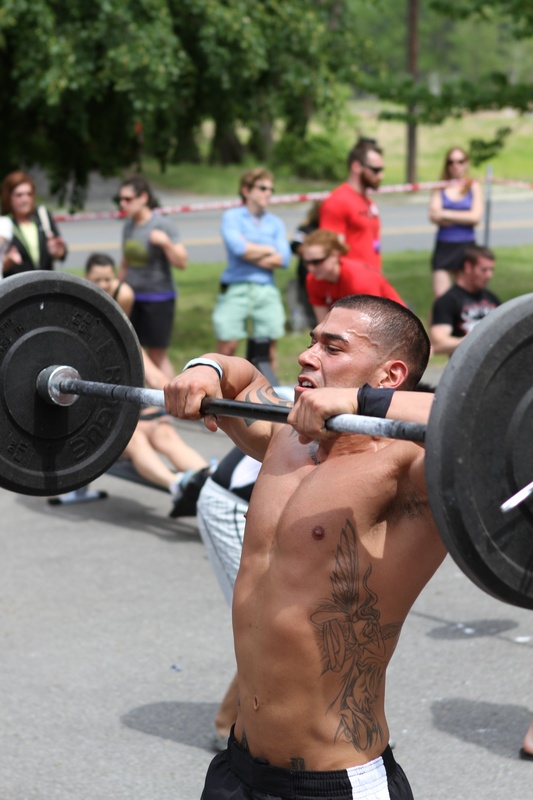 Again the best time posted was by CrossFit New England, tearing through it in 14:35. Each person starts at a different station, and everyone must complete 30 reps of their movement before they can rotate to the next. Once everyone has finished all 4 stations they must push a sled relay style (men loaded with 90 pounds, women with 50) across the finish line. But wait! If that didn't sound challenging enough, one person on the team must wear a weight vest throughout the entire duration of the workout. This looks to be an epic sprint to the finish. And talk about a STRONG finish to the 2nd day here at the Northeast Regional Qualifiers. After an exciting day filled with outstanding performances the best might have been saved for last. The 2nd Individual workout was simple, 3 Rep Max Clean and Jerk. Again, the fan favorites did not disappoint. The Men's heats came first, Rob Orlando made a huge statement posting a score of 300 pounds, sending the crowd into hysterics. The Women's heats were equally exciting, with Jessica Pamanian hitting 170 pounds in the very final heat with little time remaining in the allotted 10 minutes. Here are the standing for Affiliates, Men's, and Women's Competitions. After the first two events, we can expect to see more brilliant efforts as the top athletes look to maintain their standings atop the leader board and others fight to unseat them. Tomorrow looks to be just as exhilarating as today, with the Affiliates heading into their final event while the Individual Competitors still have 2 workouts looming. Will heat times for individuals be posted online tonight? 22 May 2010 / 6:36 p.m. It's been a privilege to be a part of this event, and the performances have been nothing short of inspiring. I couldn't be prouder of all the members of CFNE, especially our affiliate cup team for winning both WOD's so far. I'm thrilled to be a part of the Northeast Regional, and proud to call CrossFit New England home. Can't wait for tomorrow. 22 May 2010 / 6:38 p.m.
What are the standards for HSPU? 22 May 2010 / 6:52 p.m.
22 May 2010 / 7:31 p.m.
22 May 2010 / 8:13 p.m.
Great work everyone, looks like an awesome event. We'll be watching the results from New Zealand. 22 May 2010 / 8:14 p.m.
22 May 2010 / 8:35 p.m.
Good Luck today. I'm guessing Derek will be wearing the vest. Way to rock - Best of Luck today! 23 May 2010 / 3:08 a.m.
23 May 2010 / 4:11 a.m. Thanks for the photos! Keep 'em coming. 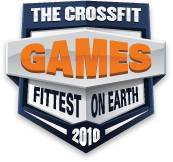 23 May 2010 / 6:39 a.m.
Has the 4th wod been announced yet? If so, what is it? 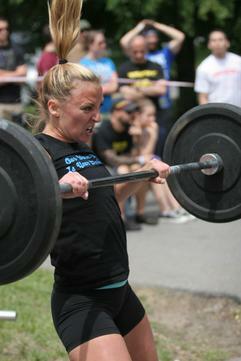 23 May 2010 / 7:59 a.m.
23 May 2010 / 2:19 p.m.
23 May 2010 / 2:47 p.m.
AP, Albany Crippler was the 4th WOD in the competition. 23 May 2010 / 6:23 p.m.
my god will someone just describe the wod. we know it was called the "albany crippler" but what does it entail? 23 May 2010 / 7:21 p.m.
Sprint across the parking lot without the Prowler to the finish line. 23 May 2010 / 8:31 p.m.
ugh, nasty wod. thanks rob. 23 May 2010 / 9:21 p.m.
WOD looks rough thx for posting Rob- Great performance! 24 May 2010 / 8:19 a.m.